The Oasis P8ACSLEE Water Cooler shall deliver 8.0 gph of 50°F water at 90°F ambient and 80°F inlet water. Model P8ACSLEE shall include an infrared sensor to activate the flow of water on the lower unit. Basin shall be designed to eliminate splashing and standing water. 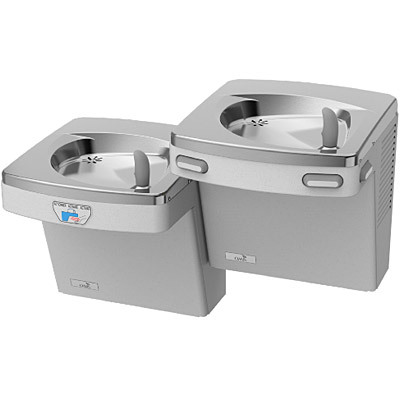 Bubbler shall have a flexible guard and operate between 20 and 120 psi. Cabinet finish shall be Sandstone powder coated paint or brushed stainless steel. Cooling system shall use R-134a refrigerant. Shall comply with ANSI A117.1 and ADA. Shall be listed by Underwriters' Laboratories to U.S. and Canadian standards. Shall comply with ANSI/NSF 61. The infrared sensor produces a light beam that is reflected off the user to automatically start water flowing. Not even a touch is needed on lower unit. If user does not move away within 30 seconds, water shuts off automatically. This model satisfies CABO/ANSI A117.1. When accessory apron is used on the upper unit, this cooler will comply with ADA guidelines when properly installed. Apron is not required when installed in an alcove or if a wing wall is installed on the right side for a right high unit or the left side for a left high unit. Model also meets guidelines for children’s accessibility providing the floor to orifice height is 30 inches and proper clear floor space is provided for frontal approach.